Form Description: When you rent residential property, whether it's a house or one of a hundred apartments, it's vital that you have a well-prepared lease agreement in place. Having written lease agreements will help avoid confusion and provide evidence and guidance in case of disputes. Our residential lease agreement template can help get you started. This form includes a standard residential lease agreement that you can customize to fit you needs. At the bottom are places for contact information and signature for each party. This version is designed for an agreement between two private individuals. This form is in full-page portrait format. You can download a PDF version of the "Residential Lease Agreement (Individual to Individual)" form absolutely free. You can also, for a small payment, download a fully editable version of the form that you can customize as you desire. (Don't know which format to choose? Here's how to make your choice.) What would you like to do? 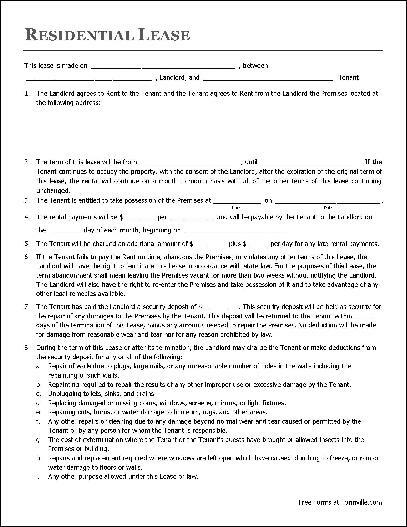 Formville's free "Residential Lease Agreement (Individual to Individual)" form is associated with the following keywords: Real Estate, Residential Lease Agreement, Residential Lease Template, Lease Form.